ONE IN FOUR mothers will experience child loss or infant loss. I have to admit, I have never heard of someone loosing their baby further into their pregnancy until it happened to a friend of mine. I didn't know how to react, because I didn't understand it. It's time to spread the awareness. It can happen to you or someone you love! It can happen to ANYONE. It happens to one in four expecting mothers. The fact is, we cannot find a set statistic on pregnancy and infant loss that is set in stone, or by a medical professional other than 1/4 expecting mothers will experience some kind of loss. I did however, find statistics compiled by Deanna Roy at Pregnancy Loss Info. Miscarriage is the most common type of pregnancy loss, according to the American College of Obstetricians and Gynecologists (ACOG). Studies reveal that anywhere from 10-25% of all clinically recognized pregnancies will end in miscarriage. Chemical pregnancies may account for 50-75% of all miscarriages. This occurs when a pregnancy is lost shortly after implantation, resulting in bleeding that occurs around the time of her expected period. The woman may not realize that she conceived when she experiences a chemical pregnancy. Most miscarriages occur during the first 13 weeks of pregnancy. Pregnancy can be such an exciting time, but with the great number of recognized miscarriages that occur, it is beneficial to be informed about miscarriage, in the unfortunate event that you find yourself or someone you know faced with one. Stillbirth effects about 1% of all pregnancies, and each year about 24,000 babies are stillborn in the United States. An early stillbirth is a fetal death occurring between 20 and 27 completed weeks of pregnancy. A late stillbirth occurs between 28 and 36 completed pregnancy weeks. A term stillbirth occurs between 37 or more completed pregnancy weeks. Are there signs? How does it happen? But sadly, most of the time we never know why it happens. "The night before I found out that I had lost my son, I was preparing for a field trip with my middle daughter. Once I finished and sat down on the couch I began rubbing my tummy as I always did - telling my husband "look he's moving again"! My son had kicked me the hardest I had ever felt right before I went to bed. When I woke up the next morning doing my normal routine, I just felt a bit off (I had normally felt my little ones wonderful kicks and he hadn't been kicking yet.) I told my husband that he hadn't moved, he reassured me that everything was ok - but I just felt like something was wrong. I went on the field trip with my daughter and the whole time nothing. I had done alot of walking the day before so I thought maybe he was just extra tired. After leaving the school I called my doctors and they told me to just go in to the hospital. We got there and waited. They tried and tried to find a heart beat - - we got nothing. So they called ultrasound tech to come in. She wouldn't let me see the screen - but the look on her face told me it wasn't good. After having 3 daughters I never would have thought after 28 weeks of carrying my baby boy I would hear the words "I'm sorry, there's no heart beat". One of the worst sentences a mother should never have to hear! My husband and I broke down! It was the worst day of my life! After losing my son my life has changed tremendously. I will never be the same person again. That kick that I felt the night before was the very last time I ever felt my son Noah Francis move. 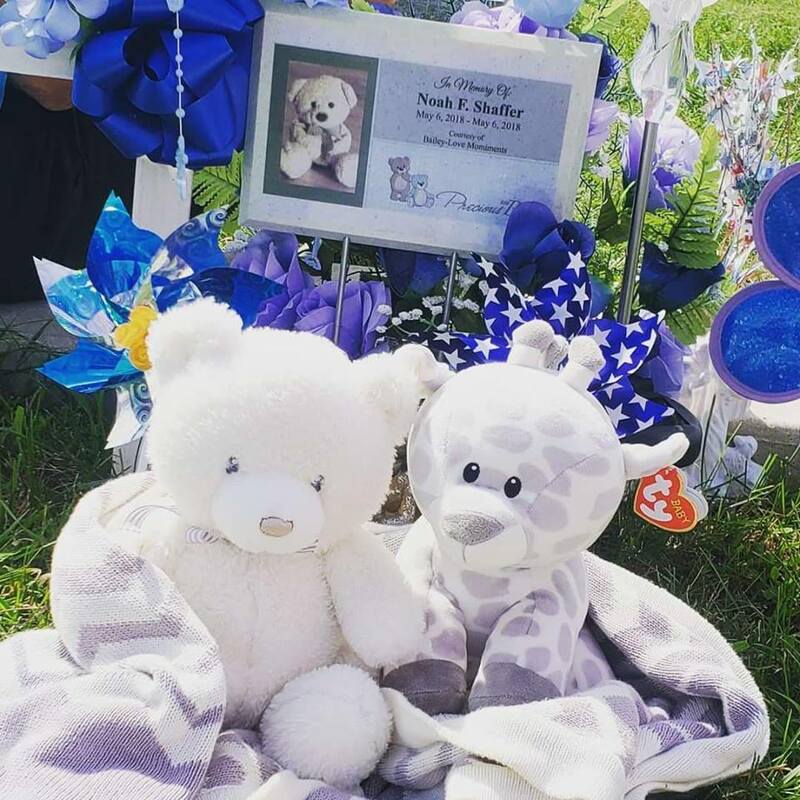 My son was stillborn but he was still born. He passed due to a cord twist at his belly button. Until this happened to me, I had never heard of this before. So I share my story so that mothers know it can happen to anyone. I am 1 in 4. I will share my story to spread awareness to other mothers that this does happen even if you do everything right. The hospital and doctor were helpful with providing me with resources as well as memorial gifts. I found alot of comfort in Facebook groups as well. I am one in four." What can you do to help someone you know that has went through such a loss? Please do not stay away or ignore the loss. Bereaved parents need your loving support. Not speaking about it does make it less real. Bring up the subject, and be prepared for tears. Nothing you say will ever make the bereaved parent sadder than the reality of losing a child. Simply allowing a safe space for them to grieve without denying that grief is all that's required of you. Remember, it is usually the simple things you say or do that mean so much. Learn more about what to say and how to help at What do I say? There are also support groups online (Facebook) with tons of women who have went through it for you to talk to and connect with someone who has been through something similar. October 15th is Wave of Light 2018. Mark your calendar! The Wave of Light is a creative concept based on progressive candle lightings all around the world at 7pm on October 15th, Pregnancy and Infant Loss Remembrance Day. These candles are lit in memory of the babies who have died too soon. If participants in countries around the world light a candle at 7 pm local time, keeping the candles lit for at least an hour, a Wave of Light will rise and propagate around the world for the whole day.